To use the same land for the establishment of a rhino orphanage. 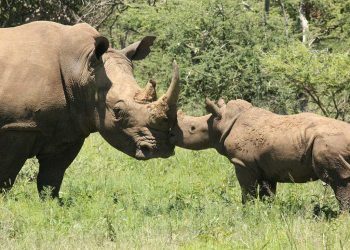 When a young rhino loses its mom, it is lost to the wild as calves are not adopted by other adult rhinos as is the case with some other species. Training up and kitting out of 3 new anti-poaching units in the Pilansberg consisting of 36 operatives sourced from communities that border the Pilanesberg National Park. Arming the head of anti-poaching at Black Rhino Reserve. Purchasing an additional vehicle for anti-poaching patrols in the Pilanesberg. Purchasing 4 Paramotor Gliders for aerial surveillance of the park together with with training of 4 pilots. Purchasing 2 drones with night time capabilities. Facilitating Community Education & Development Programmes (CEDP’s) in the communities bordering the North West areas of the Pilanesberg beginning with the Mothlabe, Bakgatla & Tlhathaganyane Communities. We are able to run the LIISR operations thanks to donations from individuals and businesses, fundraising events and grants from conservation organisations – as well as donations received from members of the LIISR. Unfortunately it takes a lot of man power and equipment to do what we do, and we need your help to fund our operations. Please make use of this portal to make your donation. Your kind donation will be acknowledged in writing. about our Adopt a Rhino project.